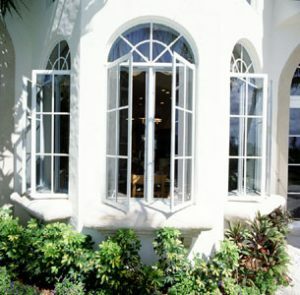 Window treatments for casement windows. A casement window is a window that is attached to its frame by one or more hinges. Casement windows are hinged at the side and are opened with a crank, which is placed around hand height or at the bottom and serves as a window lock. This important aspect is vital to keep in mind when shopping for window treatment styles. Fashion and functionality can combine with solutions from Hirshfield’s. Shannon, the Hirshfield’s Shop at Home resident window treatment expert, shares how to select window treatments featuring style and accessibility for casement windows. Take a look at where your screens are located and how easy are they to remove. Check for mounting depth for an inside mount application. Typically in a casement window, the screen is toward the interior of the home and can unclip from the window for cleaning. This can pose an issue when looking at certain products. A window treatment expert can help determine if there is enough height clearing for the bracket, and or depth for an inside mount. You are able to use the full range of window treatment products offered for casement windows, which allows you to select from different opacity options, features and benefits. A cordless lift feature works well. By having a cordless lift, the chance of the window treatment getting caught on the crank is minimal, as you are controlling the shade yourself. Don’t forget about the screens and cranks! Both of these can cause trouble for an inside mount application. The cranks can catch on the back of the window treatment when raising or not allow the treatment to lay properly when closed. There are t-handles available. T-handles, or butterfly cranks, allow for a smaller handle that will sit closer to the window and help allow for a better fit of the window treatment. Excellent post! I am looking into getting some window treatments for my home as well, I think that this treatment for my casement window will be excellent. Thanks again! Casement windows can get so tricky! How did your window treatments turn out?